When is the best time to change jobs? Is love in your future? Is it a good time to make a big investment? Everyone asks questions like these throughout their lives, but it's hard to know the answers. 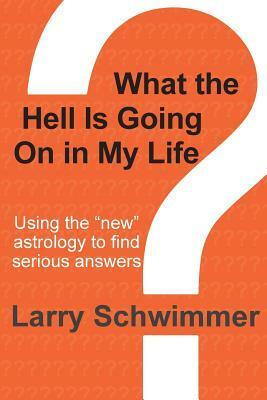 In What the Hell is Going on in My Life, Larry Schwimmer introduces a "new" astrology that can help you answer some of these questions. The book begins with an introduction to the basic ideas around astrology, all of the famous people who have been using astrology, and how you can use astrology to make decisions. I will admit that I know quite a bit about astrology since I have a friend who is an astrologer and taught me all about the "old" astrology years ago. So the introduction and the first few parts of the book were a bit slow for me. I think they'd be an interesting introduction for those who are not knowledgeable about astrology, though. Where I really got into the book was the "meat" of it, which begins with Part V. This is where Schwimmer begins going from house to house (there are 12 houses in the astrological chart) explaining the significance of the transits of the five outer planets (Jupiter, Saturn, Uranus, Neptune and Pluto). If this has started to sound confusing to you, I promise that those first several parts of the book will put it all into perspective in an easy-to-understand way. Schwimmer describes each house and what it is all about. Then he goes into detailed descriptions of what you may find your life focusing on when each of the five outer planets transits through that house. For example, the 1st house rules your personality and outer appearance. Jupiter passing through this house can make you feel optimistic and cheerful, and it can bring opportunities for personal growth. You may decide to better yourself in some way, whether physically or emotionally. On the other hand, when Saturn passes through the 1st house, you may spend time re-evaluating your personality and personal goals. You'll feel more serious and introspective. You may now wonder how you will know which planets are in which houses of your astrological chart. Part IV of What the Hell is Going on in My Life provides information about obtaining those details. Schwimmer has set up a website where you can get a free list of the five outer planet transits. The list also provides details on your natal chart. The list is very simple; it doesn't provide a detailed astrological chart. It provides just enough data to help you apply the information you'll get from the book. If you're interested in astrology and would like to see how amazingly accurate it can be, definitely check out What the Hell is Going on in My Life by Larry Schwimmer. If you're already well-versed in astrology, you probably won't get as much out of this, although it was a nice recap of the effects of the five outer planets. This review was written based on a copy of What the Hell is Going on in My Life? that I received from the author in exchange for an honest review.